Rellenong bangus is one of the most popular dish in the Philippines. On top of the delicious taste and unique process of preparation compared to other fish recipes, the amount of work involve is tedious. Separating the skin from the meat and deboning and flaking of the milkfish meat requires a lot of patience. But after all the hard work of deboning, marinating the skin, cooking the meat with all the ingredients, stuffing the skin with the fish meat mixture and frying is the reward of eating a unique and delicious Filipino dish. By the way, the preparation of removing the meat from the skin can be done in two ways: one method is cutting the back of the fish and scraping it’s meat and bones from the skin, then sewing it up with a thread and needle after stuffing it of course, the other one is braking nape and tail of the fish and using a palette knife or the handle of the aluminum ladle to remove the meat without breaking or cutting the skin just like the recipe I have below. Then squeeze out the fish meat from the skin beginning from the tail and afterwards you can remove the fish bones after boiling the fish meat (see video on the bottom the actual process). The second method requires a good skill in scraping the meat. But I guess practice makes perfect. Also, there are many kinds of kitchen ladle nowadays. What we need is the old typical aluminum “sandok” with a straight handle end and a hole for hanging it on a wall. But you can easily use a pallete knife or frosting spatula. 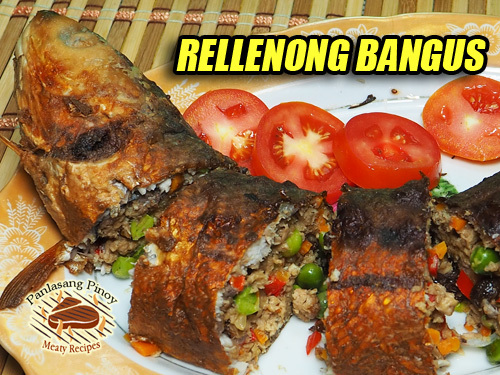 Rellenong bangus is one of the most popular dish in the Philippines. On top of the delicious taste and unique process of preparation compared to other fish recipes, the amount of work involve is tedious. Scrape fish scales. Clean. Gently pound fish to loosen meat from the skin. Use flat side of a knife in pounding. Break the big bone at the nape and on the tail. Insert the end of the handle of an aluminum kitchen turner (sandok) through the fish neck. Gently scrape down the handle between the meat and the skin. Scrape down to the tail, going around and on the other side of the fish. If you feel the meat is entirely separated from the skin, remove the handle, squeeze and push out meat (with the big bone), starting from the tail going out through the head. This way, you will be able to push out the whole meat without cutting an opening on the skin. Marinate skin and head of fish with soy sauce and calamansi ( lime ) juice. Set aside. Boil fish meat in a little water. Drain. Pick out bones. Flake meat. Saute garlic until brown. Add onion and tomatoes. Stir in fish meat, carrot, and pepper. Season with salt, vetsin, ground pepper, and Worcestershire sauce. Add raisins. Transfer cooked mixture to a plate. Cook, then, add raw egg and flour. Fill in mixture in bangus skin. Wrap bangus in wilted banana leaves or in aluminum foil. Fry. Cool before slicing. Garnish with sliced fresh tomato, spring onions or parsley. Serve with catsup. Below is the video on how you skin the bangus without cutting the skin so there is no need to sew it up. Just use a frosting spatula. Hi Sheila, I haven’t tried baking it but I’m sure it can be done. And with regards to how long and what temperature, you can try 350°F for 30 to 40 minutes. Just experiment which temperature is best. Hi Nicole, Sure you can. As long as you won’t post in on any websites. Hi Nicole, I said you can’t post it on websites. iBook is an app so I think that is okay. The contents of an app is not indexed in search engines like Google or Yahoo. Hi! Do you fry it with the wrapped banana leaves? Appreciate your response. Thank you! Hi Candy, no need to wrap it in banana leaves because it is already coated with flour.